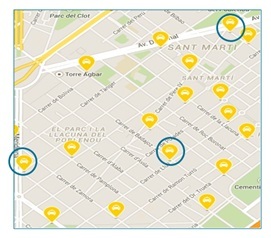 With our taxi tracking app solution we hope to help manage the taxi distribution in Barcelona by guiding taxi drivers to head to empty stands waiting for a service, or to those which have the highest demands to pick-up clients. Find out how we are planning on developing this app and when the trials begin! Over the last few months Cenit, Cellnex and the city council have worked together to identify the taxi stands that will host in this measure. We have been also in contact with the taxi institute of Barcelona (IMET) which is the public organisation that regulates this sector in the city. Three taxi stands were selected –shown adjacent- based on the requirements of IMET and the specifications set out by Cellnex e.g. network coverage in order to ensure good communications. The idea is to develop a tracking app solution consists of the monitoring these taxi ranks in order to provide valuable information for both taxi drivers and users of their services. Through the installation of parking sensors in the taxi stands and its connection to the GrowSmarter platform it will be possible to develop an app to inform of the availability of taxis in real time. This will enable taxi drivers to head to empty stands waiting for a service, or to those which have the highest demands to pick-up clients. The information provided will be very valuable and the measure will evaluate if a full roll-out to the city is feasible. From the client point of view, the information displayed will also be useful as they would have the option of heading to the stands with the higher number of taxis and increase the probability of taking one. The city council has already contacted several technology providers to start the procurement process. Meanwhile Cenit and Cellnex have been discussing how the information will be provided to start creating the app that will display the information. The installation and the trial period is expected take place during the last trimester of the year to start full operations in early 2017.